I yesterday attended a demonstration of the T4 in the UK. The configuration was 4 tops over two S10 subs a side, groundstacked. Dem was via playback of board tapes and CD's, we also tried out with a Beta58 as a quick vocal test. System was surprisingly loud and focused well 60m back (limit of the distance we could get away from the rig). The DV4's were pretty evenly balanced, possibly lacked a little low mid/upper bass penetration, but that is probably to be expected due to the dual 6.5 driver configuration, I would hazzard a guess that the DVA T12 probably has more "punch" in this area. At their price point (and there is pretty much nothing that isn't a lot more money) they provided a very good sound that could keep pace with many more expensive options. The DVA S10 was a bit dissapointing. Suitable for corperate and playback systems, but it didn't intergrate so well. It is a band pass box and sounds it. For music events I would strongly advise looking at the S20 or S30, these would likely be far more suitable. Sorry the review is fairly basic, the listen was for a supplier of mine who is considering buying (12 T4's and probably 4 T12's with 6 S20's/S30's) into the system. My reccommendation was that it represented very good value for money and that for regional suppliers that do the odd events for a 2,000 - 4,000 people where they didn't need to meet specific rider requirements it would be great. I will try and post some additional information when I've had the chance to "use it in anger". Well some additional information. I've used the system the last couple of weekends. The first job was an Olympic carnival and torch relay in Hackney, London. We had 2 S20 subs and 4 DVA T4's a side on the back of a truck with a samaba band. The S20's are a totally different beast to the S10's. They intergrate much better with the T4's and the frequency response is much wider. They are seriously powerful double 18 boxes. The T4's are great, particularly when price is considered. Top end extension isn't the most powerful and perhaps they lack a little "sparkle" when compared to some of the best out there. The second job was an outdoor concert on a beach. The configuration was 2 S20's a side with 6 T4 tops a side ground stacked. We used 2ft lite-decks to stack on to get a little more lift for the T4's. The T4's have dip switches on the back for changing configuration, we went with standard settings as there wasn't time to run the Ease software or sim the rig. Running the rig without any FOH eq it sounded fairly good. We opted for a touch of eq to reduce a little in the 2-2.5khz region (about 1.5db maximum). As mentioned before we didn't have time to play, but I suspect this was partly due to driver interference patterns. The T4's provided a lot more midrange punch than I expected. 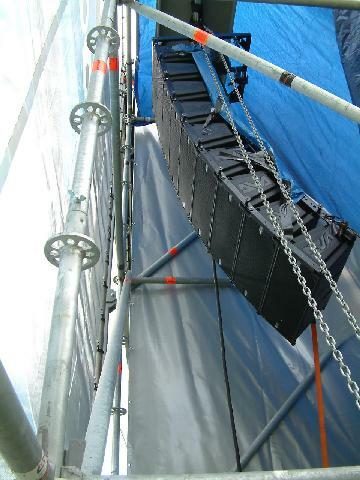 The previous year we had used 4 D&B Audiotechnik Q1's over 4 Q subs with a pair of B2's stacked in the centre and the T4's had a lot more penetration in the 300hz - 1khz range, whereas the Q1's tended to crowd up more as they are driven. At lower volumes I prefer the Q1, the T4's "rock out" better. The S20 subs performed extremely well. Whlist the concert was generally quite loud, the S20's were not anywhere close to their limits. I will be using a similar system in September, with 6 x T4's, 2 x T12's and 2 S20's a side, the tops will be flown. I will run the ease software prior to this event. I'm also considering running the S20's in a centre cluster in front of the stage to avoid "power alley". If anyone has any comments or questions please ask and I will let you know my thoughts. The DB Technologies DVA series are all self powered. The maximum configuration I've used has been 6 tops a side. As they are all self powered the crossover configuration is (as far as I kow) fixed and can't be altered. 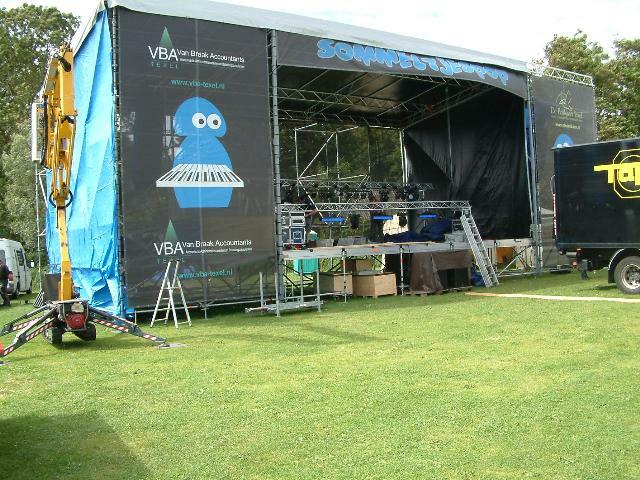 When using the 6 per side configuration we were able to cover an area for around 3,000 people. I didn't buy the speakers personally, they were bought by a company I use called Just Sound and Light (JSL), I believe he is now a dealer for DB Technologies. I understand that the top cabs (DVA T4's) are around £1150.00 each inclusive of the VAT street price. For that money it's an awful lot of "bang for the buck" and sound quality is good too boot. a 3000 people with 6x T4 ? ?